3. 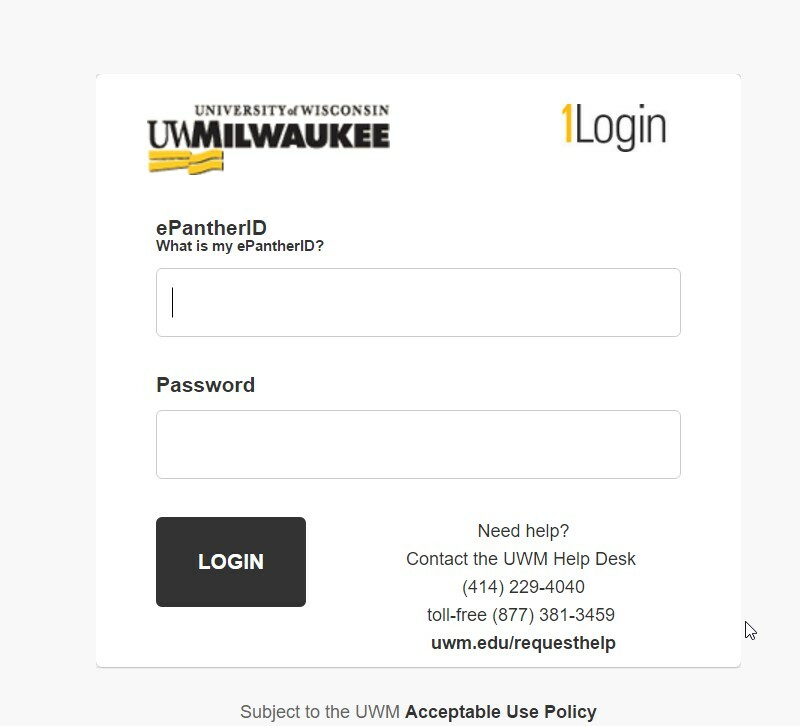 Enter your UWM credentials (epanther ID and password). 5. Please note: if you do not wish to add your birthdate, just use 00/00/0000 or a similar configuration. Date of birth is required for the applicants but is not being used for anything for Faculty and Staff. Reviewers can see everything that the applicant has answered and uploaded in the application. Reviewers can make an internal admission recommendation and include internal comments. 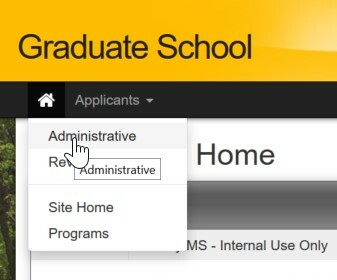 Reviewers will log into the application using the UWM STAFF/FACULTY LOGIN/REGISTER button. They should have already created an account and received their Reviewer access. 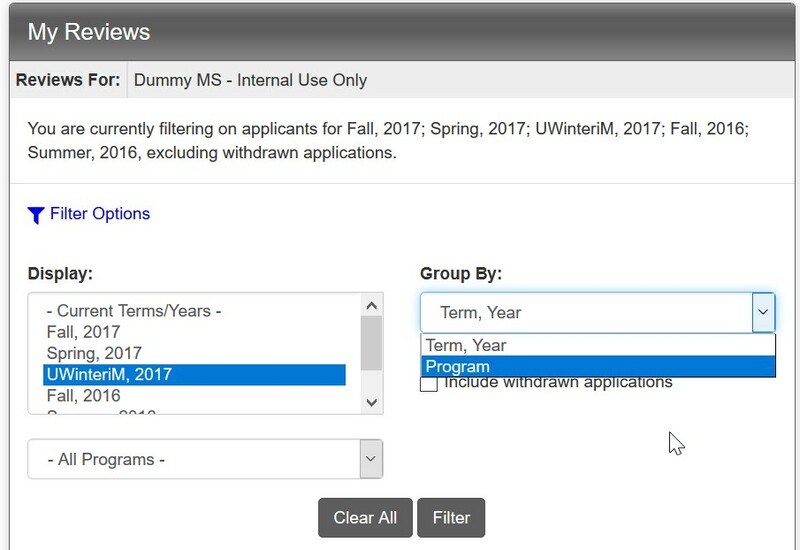 After logging in they will see a list of applicants to the programs to which they have been assigned, based on their security access. Filter Options: It is possible to set up a filter to display and group the applications by clicking on the Filter Options link (blue link). Customize options and then click on the Filter button. To access an application, the reviewer will click on the applicant’s name (in blue). Please remember that the application must be marked Ready for Review by the program’s admin user. Reviewers have immediate access to everything that the applicant has submitted in their application, including letter of recommendations. After clicking on the applicant name, the application will display on one continuous page. Reviewers also have access to Test Scores, Transcripts, and GPA. 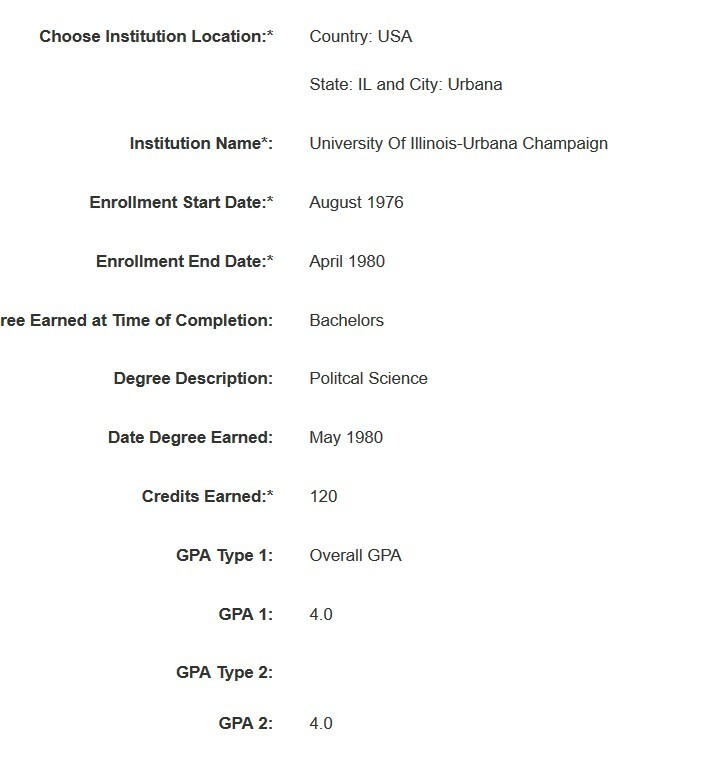 After clicking on the applicant’s name, access the Test scores by clicking on the TEST SCORES button located in the right hand corner at the top of the screen. Transcripts are accessed by clicking on the TRANSCRIPTS button. Accessing Transcripts: Click on the Transcripts button in the top right hand corner. That Institution record will display. Included on this page is the attendance and degree information. GPA information will be located on this page. To see the actual transcript, scroll down the page to the Upload Transcript box, and click on the transcript file name (blue link). HINT: Always use the back button on your browser in the upper right hand corner when leaving the Transcript and Test Score sections to return to the Application. HINT: Reviewers can move around the application and if needed return to their Reviewer home page by clicking on the House Icon in the upper left hand corner and choosing Reviewer from the drop down menu. 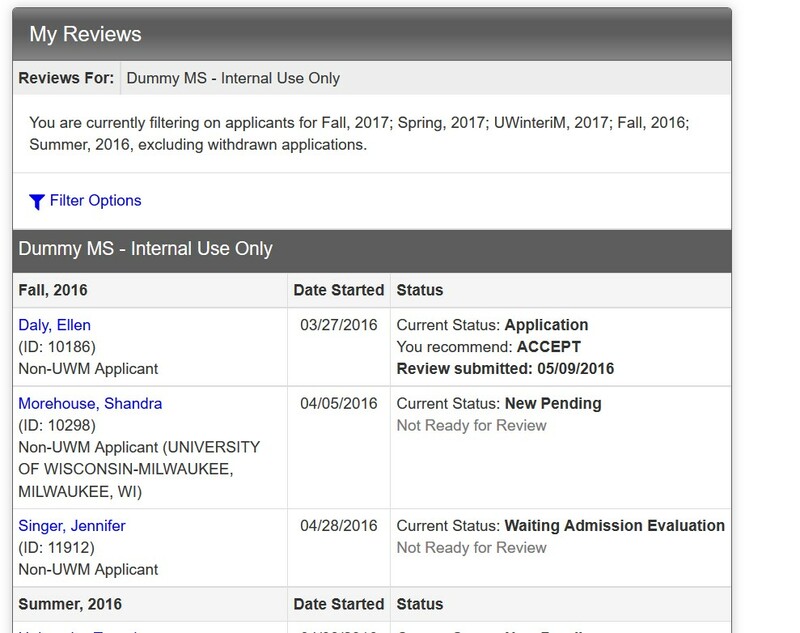 After reviewing the application, the reviewer will enter an admission recommendation and any necessary comments that only the Program Admin user(s) can see. 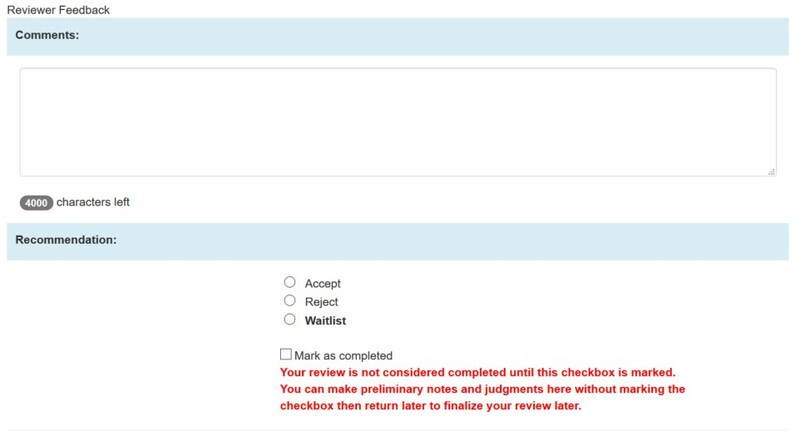 Once done, the reviewer will mark the review complete so that when they go back into review they can see which applications they have already reviewed. The standard version above involves access assigned to the Reviewer at the degree level. There are times when the access requires assignment at the concentration or area of interest level. For Reviewers requiring access at this level, they will need to have queries created and shared with them. The queries gather applications based on a set of defined parameters. 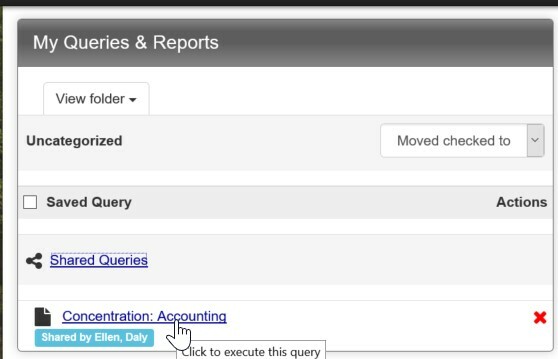 Click on the link Shared Queries (blue link) to see a list of assigned queries. Click on the query name to get the list of applicants to be reviewed. 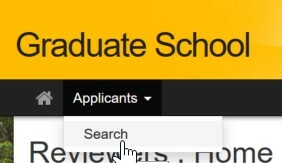 Click the to go back to the Reviewer page, scroll down to the name of the applicant name from the query list, and click on the applicant’s name. After this step is complete, the review process will be the same as for the Standard Version above. HINT: If it is necessary to get back to the page with the Shared Queries link, go to the house icon in the left hand corner, and choose Administrative from the drop down menu. The Reviewer can add internal comments while in Reviewer access. These comments are only visible to the Program Admin user(s) and not the other Reviewers. If the Reviewer wants to add a comment that other Reviewers can see, they must leave the Reviewer view and navigate to the actual application. 3. Enter the name of the applicant in the Search box. 5. Find the applicant by confirming name, program and admit term. 7. Click on the Comments button. 8. Enter any comments and click Update. 9. When finished entering comments, click on the in the upper left hand corner and choose Reviewer to return to the Reviewer page, or Administrative to return to the Shared Queries page.